By their nature, the manufacture, storage, and transport of chemicals are accidents waiting to happen. Chemicals can be corrosive, toxic, and they may react, often explosively. 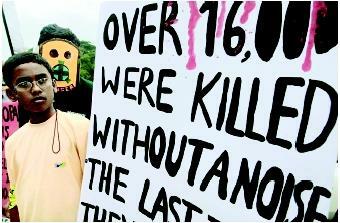 The impacts of chemical accidents can be deadly, for both human beings and the environment. Many if not most products we use in everyday life are made from chemicals and thousands of chemicals are used by manufacturing industries to make these products. The source of many of these chemicals is petroleum, which is refined into two main fractions: fuels and the chemical feedstocks that are the building blocks of plastics, paints, dyes, inks, polyester, and many of the products we buy and use every day. Fuels and chemical feedstocks made from petroleum are called organic chemicals. The other important class of chemicals is inorganics, which include acids, caustics, cyanide, and metals. Commercial products made from inorganics range from car bodies to computer circuit boards. Of the more than forty thousand chemicals in commercial use, most are subject to accidental spills or releases. Chemical spills and accidents range from small to large and can occur anywhere chemicals are found, from oil drilling rigs to factories, tanker trucks to fifty-five-gallon drums and all the way to the local dry cleaner or your garden tool shed. A train derailment near Milligan, Florida. The train carried chemicals, which were spilled at the site. One of the worst industrial chemical disasters occurred without warning early on the morning of December 3, 1984, at Union Carbide's pesticide plant in Bhopal, India. While most people slept, a leak, caused by a series of mechanical and human failures, released a cloud of lethal methyl isocyanate over the sleeping city. Some two thousand people died immediately and another eight thousand died later. Health officials, not informed about chemicals at the factory, were completely unprepared for the tragedy. Congressional hearings that followed the Bhopal accident revealed that U.S. companies routinely discharged hazardous chemicals into the air, while emergency planners knew little about the potential for disaster at local industrial facilities. Less than a year later, a Union Carbide plant that produced methyl isocyanate in Institute, West Virginia, leaked a toxic cloud in the Kanawha Valley. While the West Virginia incident was not another tragedy, it was a shocking reminder that an accident such as the one that occurred at Bhopal could happen in the United States. The hearings and media attention to institute led to enactment of the Emergency Planning and Community Right to Know Act of 1986 (EPCRA), requiring companies to provide information about their potentially toxic chemicals. At the same time, states were required to establish emergency planning districts and local committees to prepare for any emergency—a fire, an explosion, a flood that might result in the release of chemicals into the environment. In 2003, more than 31,000 industrial facilities must report more than 650 individually listed toxic chemicals and chemical categories to the U.S. Environmental Protection Agency (EPA) that is made public in the Toxic Release Inventory. In 1990, amendments to the Clean Air Act required industrial chemical companies to submit a risk management plan that included "worst case" chemical accident scenarios. Industry leaders did not want these potential disasters made public and argued that they could alert terrorists which facilities to target. In July 2002, the Senate's Environment and Public Works Committee approved a bill to identify plants vulnerable to terrorist attacks that produce hazardous chemicals. Congress also voted against a landmark community right to know law that would have required some 6,600 chemical facilities to reveal their "worst case" accident scenarios. Although the major chemical accidents seem most threatening because they often kill people outright, it is the smaller, more routine accidents and spills that affect most people. Some of the most common spills involve tanker trucks and railroad tankers containing gasoline, chlorine, acid, or other industrial chemicals. Many spills occur during the transportation of hazardous materials; one study found that 18,000 hazardous materials spills occurred during 1976. 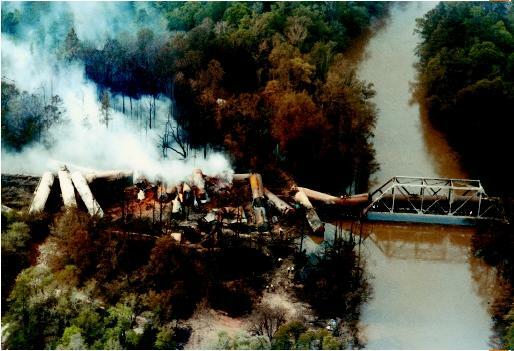 In 1983, spills from 4,829 highway and 851 railroad accidents resulted in eight deaths, 191 injuries, and damages exceeding more than $110,000,000. The National Environmental Law Center reported that 34,500 accidents involving toxic chemicals were reported to the EPA's Emergency Response and Notification System between 1988 and 1992, meaning that on average, a toxic chemical accident was reported nineteen times a day in the United States, or nearly once every hour. Emergency response workers are especially at risk. In 1988 six firemen were killed minutes after arriving at the scene of two burning pick-up trucks in Missouri, when more than 30,000 pounds of ammonium nitrate stored in a nearby trailer exploded. This incident led to the formation of the hazardous materials division of the Kansas City, Missouri, Fire Department, specializing in hazardous materials handling. This boy is looking at a Greenpeace poster, which expresses solidarity for the victims of the Union Carbide chemical disaster in Bhopal, India, eighteen years after the incident. One of the most common concerns over chemical accidents and hazardous materials spills is acute, or short-term, toxicity. Acutely toxic contaminants, such as cyanide and chlorine released from hazardous materials spills, pose an immediate threat to public health. For example, a chemical accident in which chlorine gas or cyanide gas is released would likely result in widespread deaths as the plume, or toxic cloud, moved through a populated area. Another class of toxicity is chronic, or long term. One of the most common types of chronic toxicity is exposure to carcinogens that may result in cancer twenty to thirty years after the time of the spill. An example of such an exposure occurred on July 10, 1976, in Meda, Italy, a small town about 12 miles north of Milan, where an explosion occurred at the ICMESA chemical plant in a 2,4,5-trichlorophenol reactor. (2,4,5-Trichlorophenol is an industrial chemical used as a building block to make pesticides and antiseptics.) A toxic cloud containing dioxins, which are very potent cancer-causing chemicals, was released into the atmosphere and spread across the nearby densely populated city of Seveso. Exposure to such carcinogens does not result in short-term health problems, but the effects may be expressed decades later. An investigation of women who were exposed to high levels of dioxin in the ICMESA explosion was published in 2002. The researchers found that the women who developed breast cancer had a ten-fold increase of the toxic chemical in their blood. Another very different effect of chemical spills and accidents is ecotoxicity, a toxic effect on the environment rather than on human health. The most dramatic ecotoxicity resulting from chemical spills results from petroleum spills at sea or in rivers or lakes. When such a catastrophe occurs, the toxicity often depends on the type of petroleum. The most common material spill, crude oil, contains some toxic chemicals that dissolve in the water. Most of the petroleum, however, floats on the water's surface. It causes environmental damage by coating the feathers of birds and the gills of fish, physically disrupting their movements and their ability to breathe. Oil washed ashore also disrupts marine life in fragile areas. One of the worst oil spill disasters in history occurred on March 24, 1989, when the oceangoing oil tanker Exxon Valdez ran aground on Bligh Reef in Alaska's Prince William Sound. Nearly eleven million gallons of crude oil spilled from the ship, and every trophic level of the biologically rich waters of Prince William Sound was severely impacted. Some residual oil remains to this day. How Are Chemical Accidents Handled? Emergency response personnel are involved in assessing the risk of hazardous material releases and working to avoid any harmful effects. Teams of workers evaluate the concentrations of the chemicals, where and how people might be exposed, and potential toxic effects on the exposed people. In many cases, emergency response teams are on twenty-four-hour call; if a spill occurs, they use source data (such as the hazmat placards on trucks and tanker cars), databases of chemical properties, and chemical movement models to rapidly predict the movement of contaminants and the toxicity of the spilled chemicals. If rapid spill cleanup is necessary, the emergency response team designs and implements cleanup measures to protect exposed populations and ecosystems from toxic responses. A wide range of cleanup systems has been developed for chemical spills. Small spills on land are cleaned up by simply excavating the contaminated soil and moving it to a secure landfill. Oil spills on water are contained using floating booms and adsorbents, or solid materials that capture the soil, so that it can be disposed of in landfills. Newer, more innovative methods for spill cleanup include bioremediation (using bacteria to metabolize the contaminants) and chemical oxidation (using oxidants, such as hydrogen peroxide and ozone to break the chemicals down). Although chemical spills represent potentially very large environmental problems from a wide range of chemicals, emergency response procedures developed by environmental scientists and engineers are providing solutions to the resulting human health and ecological effects. Chemical accidents and spills can be devastating to humans, wildlife, and the environment. The best way to reduce the harm caused by chemical accidents is to design plants with better safety controls that operate at lower temperatures and pressures, and to use and manufacture less toxic compounds, a field that is being pursued by "green" chemists and engineers. But until toxic chemicals are routinely replaced by less harmful substitutes, the emergency response procedures developed by environmental scientists and engineers help lessen the human health and ecological effects of chemical spills and accidents. Hackman, C.L. ; Hackman, E.E. ; and Hackman, M.E. (2001). Hazardous Waste Operations and Emergency Response Manual and Desk Reference. New York: McGraw-Hill. Watts, R.J. (1998). Hazardous Wastes: Sources, Pathways, Receptors. New York: John Wiley & Sons. U.S. Chemical Safety and Hazards Investigation Board Chemical Incidents Report Center Web site. Available from http://www.csb.gov/circ/post.cfm . Working Group on Community-Right-to-Know Accident Data Web site. Available from http://www.rtk.net/wcs . Hazmat Safety Web site. Available from http://hazmat.dot.gov/hazhome.htm .